Whenever a nontoken creature you control is put into a graveyard from play, put a charge counter on Lightning Coils. 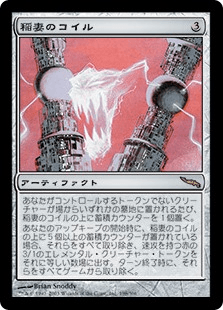 At the beginning of your upkeep, if Lightning Coils has five or more charge counters on it, remove all of them from it and put that many 3/1 red Elemental creature tokens with haste into play. Remove them from the game at end of turn.